Another weekend flies by and it's Monday morning again, already ... i could've done with an extra day - this drive to take off the Monday seems to be growing with each week! Anyway, the weekend was lovely and relaxed - a good thing judging from the next few weekends (and weeks in between) I have planned. Here's a sneak preview: Swan Lake, the Pink Concert, the Pro 20 Cricket World Cup Opening Match and Joburg Day. But, back to this weekend. 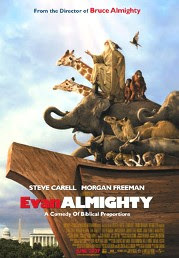 On Friday night Varen & I went to watch Evan Almighty. Evan help us. The sequel will take the news anchor character Steve Carell played in Bruce Almighty and put him on an Almighty-inspired quest to build an ark in preparation for a great flood. Mildly amusing overall, although there were some truly funny moments. I think my favourite part of this movie is how they chose to do a sort-of sequel to the original movie, Bruce Almighty. The ending is fairly dull predictable Hollywood stuff, as one would expect from a comedic movie with a religious theme that is desperately trying not to offend. On Saturday we went test driving once again. We hit Citroen for a second drive of the C2, plus a look at the colour and interior options - turns out the blue isn't nearly as bad as the orange ;) And then we headed to the Randburg Ford to try out the Fiesta Trend model. This is an equally convincing car in the specs, but hell, it was a heavy drive. 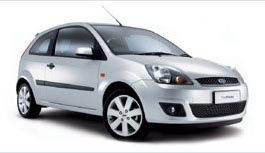 Not a bad little car, aside from the Nissan Micra-like lights in front and the fact that I had to test drive a sales-person's actual car with all her strange fluffy toys (teddy bears, I ask you?) and sunglasses and whatnot cluttering up the car - which doesn't give you a very good impression of the car. I think I'm sticking with the C2 :) I think I've finally decided. Sheesh, this is big news! Later Varen's mom and sister came over for dinner (his dad was at the farm - jealous!) Was a lovely evening while we teased Brother Zion about keeping it in the family and taking Brother Swoop's girlfriend's sister out :) Entertaining family politics. Sunday was supposed to be lazy and mostly was aside from the nearly early morning as we headed over to his Folk's house for breakfast - I wanted to try using the Mac to rip some still out of my Gorilla vids. Then we hung out there lazing in front of the DSTV before heading home for some Series. The afternoon found us back at Varen's folks for a late lunch with the whole family (almost - Brother Swoop is almost never seen) and then back at his place to finish off (finally) Season 6 of 24 - not nearly as impressive as all the rest. I'm trying - gotta get all these things signed (since Daddio owns my current mode of transport) and have the trade-in valued (yikes!) and then find the financing (say yes, say yes!) not to mention getting my own insurance :( for the damn thing! It is quite an exhausting process! It is tough being an adult isn't it? it is :( I won't even go into the schlep I have been thru today only to discover the Daddio seems to have misplaced the ownership papers of my car - without which, a sale is, obviously, impossible! Waaah!